2015 champion Eliud Kipchoge takes on 2014 champion Wilson Kipsang when the two Kenyans head a stellar field at the Virgin Money London Marathon in the British capital on Sunday 24 April. Kipchoge beat two-time champion Kipsang by just five seconds in a thrilling sprint finish at the end of last year's 35th race, with world record holder Dennis Kimetto (Kenya) left to fight for third place. Kipchoge's winning time of 2:04:42 was a fraction outside Kipsang's course record, and the former world 5000m champion went on to win the BMW Berlin Marathon last September in a personal best of 2:04:00 and currently leads the Abbott World Marathon Majors rankings. He now sits sixth on the all-time list behind Kimetto's historic best of 2:02:57 and Kipsang's former world record of 2:03:23. Kimetto returns to London in 2016 hoping to improve on his third place last year and Stanley Biwott is the fourth outstanding Kenyan in the field, running in London for the fourth time after finishing fourth last year, second in 2014 and eighth in 2013. Biwott should be full of confidence after an impressive victory at the 2015 TCS New York City Marathon. With Rio 2016 Olympic places to be won, there will be even more at stake for the Kenyan greats in 2016 when the quartet toe the London start line again in pursuit of one of world running's most prestigious prizes. The promise of an Olympic berth could well be the incentive Biwott needs to finally top the London podium. "It was fantastic to win the Virgin Money London Marathon last year against one of the greatest fields ever assembled in marathon running," said Kipchoge. "This year I will come back to London to compete again with the world's best athletes. I will work hard to defend my title in London and, together with Wilson, Dennis, Stanley and those from other countries, make it a fast and wonderful race. I want to thank the organisation for again bringing the best athletes in marathon running together in London, it's great for our sport." Kipchoge's superb record of five wins and one second place from six marathon starts since 2013 will make him the marginal favourite from a stellar elite men's field that contains the top five finishers from 2015, five men who have run the 26.2-mile distance in under 2 hours 5 minutes, and 16 who have finished quicker than 2:10. Biwott, Kimetto and Kipsang are likely to be the champion's main challengers, with the latter two looking to make amends after dropping out of the World Championships race in Beijing last August. Kipsang has always shown great form in London with victories in 2012 and 2014, but he was unable to retain his New York title in November when he finished fourth. Kimetto will also feel he has something to prove after losing touch with his two compatriots on the run for home along London's Victoria Embankment last year. He also dropped out in the early stages of December's Fukuoka Marathon and hasn't won a race since his world record victory in Berlin in 2014. However, the Kenyans will be challenged by runners from neighbouring east African countries, not least Ethiopia's triple Olympic gold medallist and multi-world record breaking track champion, Kenenisa Bekele, and Eritrea's teenage hero from the Beijing World Championships, Ghirmay Ghebreslassie. The 33-year-old Bekele moved up to take on the ultimate distance challenge in 2014 when he won the Paris Marathon in 2:05:04 before finishing fourth in Chicago that October. Injury kept him out of action in 2015, and he will be keen to make his mark on a long-awaited return to the roads against one of the toughest fields he's ever faced. Ethiopia's talented quartet also includes Tilahun Regassa, who was fifth here last year, Endeshaw Negesse, the 2015 Tokyo Marathon champion, plus last year's Rotterdam champion Abera Kuma – all men who have run quicker than 2:06. Ghebreslassie, who became the surprise world champion in Beijing, makes his first appearance in London alongside four compatriots – former Eritrean record holder Samuel Tsegay; Ghebrezgiabhier Kibrom, who finished eighth last year; Amanuel Mesel, who was ninth in Beijing; and Tewelde Estifanos, last year's champion at the Oita Marathon in Japan. Ukraine's nine-times European cross country champion, Serhiy Lebid, is the top European in the line-up. He finished 10th last year. German record holder Arne Gabius also earns a place following his barrier-breaking fourth place in Frankfurt last October, while Poland's former steeplechaser Marcin Chabowski and Lebid compatriot Vitaliy Shafar could also be top 10 contenders. No fewer than 13 Britons are set to line up at the elite Blue Start with hopes of securing a place on Team GB's Rio-bound Olympic plane. Londoner Scott Overall and Scot Callum Hawkins have already beaten the Olympic qualifying time of 2:14 with confident autumn runs in Berlin and Frankfurt respectively. They just need to be among the first two Britons across the line to guarantee a ticket to South America. Among those hoping to join them are Chris Thompson, the 2010 European 10,000m silver medallist, who was 11th on his marathon debut two years ago and Leeds City's Derek Hawkins. Ian Kimpton and Matthew Hynes both lowered their PBs in 2015 to within touching distance of the Rio selection time while Phil Wicks, Ben Moreau and John Beattie could also be in contention. Virgin Money London Marathon Event Director Hugh Brasher said: "After such a fantastic finish to last year's race, and a brilliant champion in Eliud Kipchoge, we can only hope for more of the same in 2016. 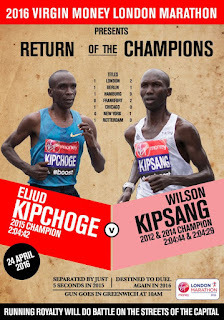 "With the world record holder, the world champion, and our own course record holder Wilson Kipsang racing, Eliud knows he will have to be at his best. It should be thrilling to watch. "And with the Rio Olympics fast approaching, the battle to be top Briton should be equally enthralling."